I was admiring the stylish dining room of good friends last weekend, and the conversation turned to how difficult it is to put together a room that was elegant and chic without having to run all over the city (or globe!) to find just the right pieces. I told them they could probably have gone to one of my favorite auction houses, Phillips, and buy everything in one place. So with the gauntlet – or on this case the napkin – thrown down as a challenge, I set out today to furnish a dining room from Phillips’ 1 October 2015 Design sales in London next week. First up is selecting your “look”: my readers know I’m all about clean, unfussy and modern design, so like a moth to the flame I immediately went to this sideboard (lot 112) and dining table (lot 113) by Paolo Buffa (1903-1970). Born in Lombardy to an artistic family, Buffa spent the 1930s decorating villas and chalets for Italy’s discerning upper crust. Not content to limit himself solely to decorating, he designed everything from furniture to lighting to carpets and textiles. His work is known for its beautiful lines – as illustrated in these two pieces shown here – and his quirkiness, which has become his trademark. 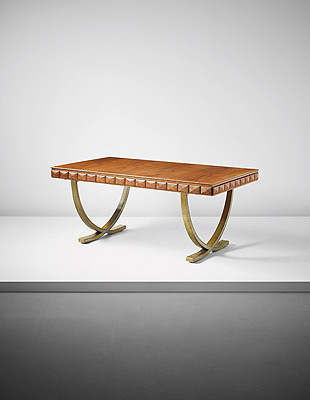 I love that the table’s lines are broken by the sweep of the bold brass legs. And the buffet adds the perfect element of texture to a stylish dining room with its patterned surfaced doors. I’m not one for going all matchy-matchy, but I feel these pieces compliment each other and do not compete for attention. And once you add your accessories to the buffet, the whole look will change dramatically! For seating in this stylish dining room, I would go with this elegant set of six chairs (lot 158) by Gio Ponti (1891-1979). A near contemporary of Buffa, the two designers briefly worked together and were very much part of Italian design’s avante-garde. 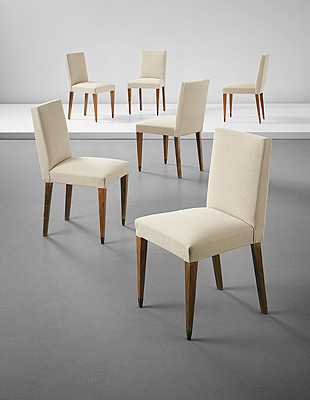 The simplicity of these chairs makes them a midcentury classic that will NEVER go out of style. 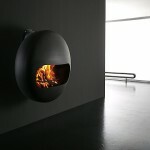 Their clean lines also allow them to work with different styles of furniture. You will have these chairs forever regardless of how many times you feel the need to redecorate! I know some readers will wonder why you would spend upwards of $1,500 per chair when you could get a similar look much cheaper from a big box store. True, one could do that, but those chairs will not last at all. At least, the Ponti chairs have a pedigree, which means that if you do tire of them, you can offer them for sale, and likely recoup a good part of your investment. With knockoffs, its money immediately flushed down the toilet. Last up is lighting, and here you can really let your personality shine! Generally speaking, dining rooms are traditionally masculine spaces. 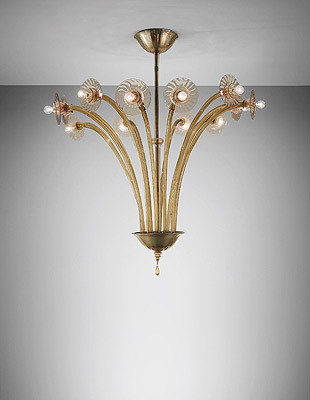 In this case, to add a light feminine touch I might suggest this wow chandelier (lot 114) by Carlo Scarpa (1906-1978). 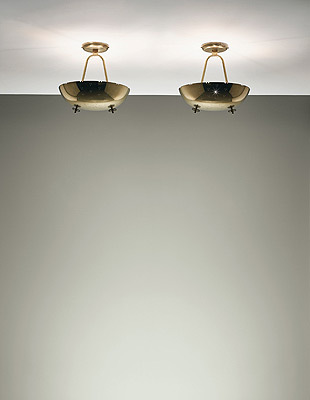 The sweeping glass branches draw the eye up and out and act as an excellent foil to the legs of the table and buffet. Venetian glass chandeliers are always a good go-to for lighting, but this one is just a little different than the rest, which makes it especially suited to a stylish dining room. 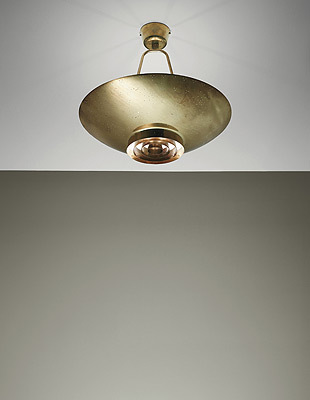 For a more “masculine” but nonetheless stylish dining room, I suggest this ceiling light (lot 228) by Finnish designer Paavo Tynell (1890-1973) that he created in 1953 for the Secretary-General’s office at the United Nations in New York. The concentric brass rings at its base allow a defined stream of light to filter down onto your dining table. And just because I can’t resist adding one last lighting option into the mix, it could be interesting to use this pair of brass ceiling light fixtures – again by Tynell (lot 232). Of much smaller and more intimate scale, they help to make the space less imposing than the grander lights previously suggested and may be more consistent in lighting the entire table area. It’s all in the subtleties when it comes to making a stylish dining room that’s YOU!!! 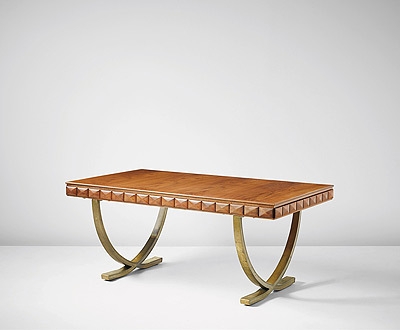 Now truth be told, not every auction is as jam packed with great pieces that you’re likely to fall in love with, but I find Phillips to be a really great source for midcentury and modern furniture. 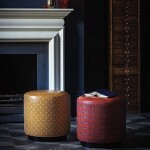 Their specialists are incredibly knowledgeable and can guide you to buying just the right object for your home. Talk to them and ask questions – they are usually more than happy to share their insights into the furniture and art they have for sale. And the good news is that if nothing strikes you this time, in six months they will be doing it all over again! image credit: stylish dining room: Phillips. 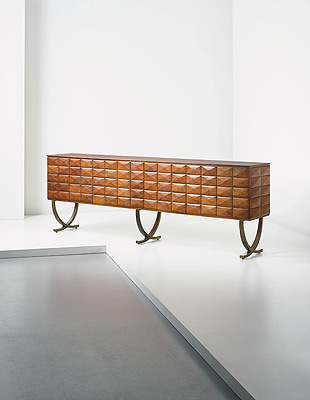 Items in this post were culled from both the Design and Nordic auctions held on the 1 October sale in London.